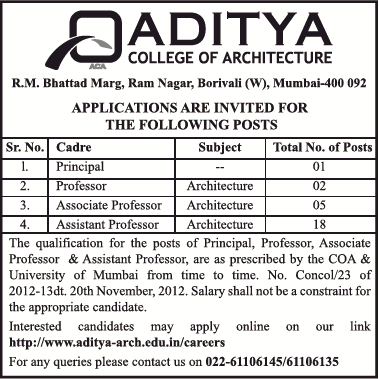 Aditya College of Architecture, Mumbai has advertised in TIMES OF INDIA newspaper for the recruitment of Professor/Associate Professor/Assistant Professor job vacancies. Interested and eligible job aspirants are requested to apply by earliest. Check out further more details below. About College: Aditya College of architecture is one of the foremost Institute for architecture in Mumbai, India. It offers Bachelor degree (B.Arch.) courses approved by Government of Maharashtra.